This Vijayadasami Brainekids is providing courses for kids (1.5 to 3.5 yrs) at a flat Rs. 25,000 per annum. Additionally, they are conducting an open Aksharabyasam for all Mugappair Residents, you can join any school and still begin your child’s Vijayadasami with authentic Pooja and Iyer at Brainekids, just register at bit.ly/Aksharabyasam. Considering kindergarten or daycare for your children? What are the qualities you look for in the place? Umm… Location, space, hygiene, staff, safety? Do you also add happiness to your criteria? What about all the moments you could possibly miss with your children? What if there’s a place that goes above and beyond to provide all the above, yes including happiness, recording their joyful moments in HD, tracking every aspect of their growth and really cares about your child? A family has just dedicated themselves to providing the best childhood to children for almost a decade now. Mr. & Mrs Radhakrishnan residents of LIC colony, collector Nagar opened a playschool named Brainekids almost a decade ago in Mugappair East, since then, they have been on a mission to provide a happy, protective space where children can explore all around, learn and grow. Brainekids has curated a fun, enjoyable and character building curriculum that allows your children to explore thematic concepts systematically introduced to them through activities, events, games and toys. The key focus for them is to provide the best childhood experience to kids and best insights on child’s progress to parents, they have developed an 8 smart progress system that monitors your child’s growth in physical, emotional, communicative, personal, interpersonal, interests and more fronts. They also send monthly newsletters to parents and weekly parenting tips and advice to help with the world’s toughest job – Parenting. Brainekids follow an explorative method of learning where children are exposed to multiple themes and they learn about them through fun activities, indoor & outdoor games, Intrinsic toys, stories, puppets, Multimedia sessions, phonics thru talking pen, field trips and of course Brainekids is now the only early childhood development centre in Chennai focusing on holistic growth of children. Their need to provide more to the society has taken them on a decade of many success stories and hundreds of happy children. 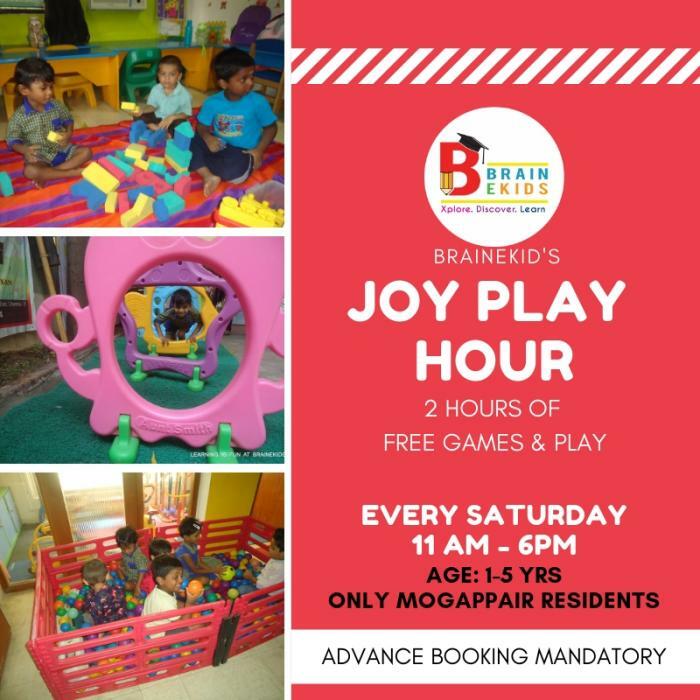 Brainekids is also providing Two hours of FREE PLAY at their premises. It is with full access to their Indoor, Outdoor, Ball pools, Kids gym and much more absolutely free. Only on Saturdays 11am to 5 pm for kids below 5 years. Register prior by sending whatsapp. WhatsApp Brainekids at 8056215564 or call 04426563489. ← Nanny Kiddies World, Rajakilpakkam | NKW Mission : Exploring Young Minds to Excel !! !